Wild Red Clover Trifolium pratense Bees love this flower!! 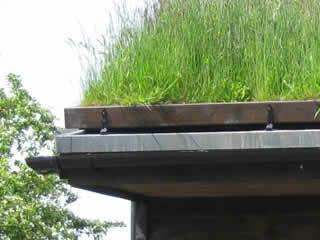 Here is our pictorial guide for the establishment of our simple green roof system. 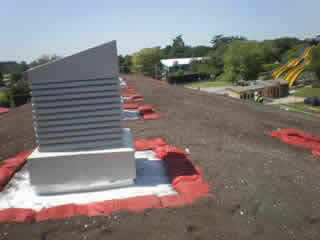 The intention is to give a step by step account of how to install the Wildflower Turf roof system. 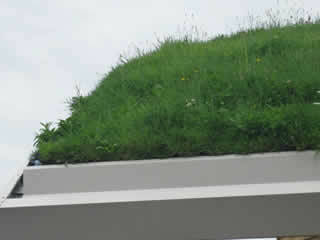 Our turf is suitable for any green roof project using any manufacturers product. Ensure that the roof structure is of sufficient strength and suitably designed to support the combined saturated weight of the turf, substrate and irrigation system. If unsure, it is advisable to consult a structural engineer, architect, or specialist contractor. Please ensure that it is safe to work on the roof. If in doubt please refer to the Health & Safety Executive web site for further guidance and availability of publications. 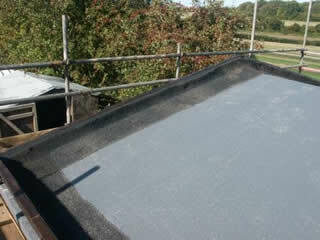 Lay a waterproof membrane over the entire roof area. 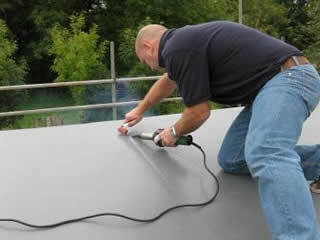 Consult a roofing contractor for an appropriate system. Pay attention to sealing around roof lights, vent stacks and other similar features where there is a higher risk of water ingress. The whole roof must be watertight. Take care not to puncture the membrane. When using loose substrate, and in particular on steeply pitched roofs, provision must be made for a retaining system at the eaves and sides of the roof. This can be in the form of a wooden batten/barge board with accompanying fixing brackets or an engineered metal L shaped strip attached to the roof structure. Your architect or roofing contractor should advise you on the design and construction of this feature. Attention should be made to the water-tightness of fixing points. 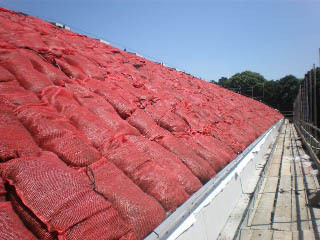 In addition to eaves retention it is advisable to install a line of our woven substrate sacks around the perimeter of the roof which provides the initial containment of the loose substrate whilst the turf establishes a root system. Adequate provision must be made for drainage at the bottom of the roof slopes. This can be achieved by leaving a small gap in the retention feature, or a strip back-filled with gravel or similar material. 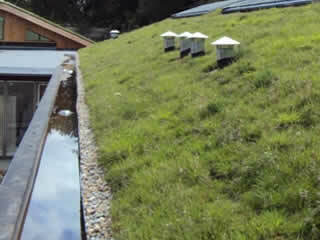 If rainwater collection is desirable, a gutter can be installed draining to a suitable collection point. Lay a strip of geo-textile permeable membrane along the inside of the barge board to allow water to drain without washing out any substrate/soil in the process. Fill area with substrate laid evenly at 100mm depth. Remember to allow 10% extra for settlement. Using our 600x460x100mm woven substrate sacks, allow 3.8 sacks per m². 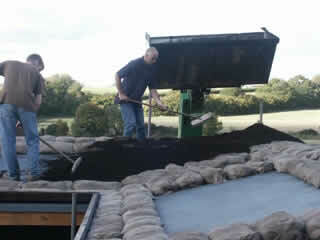 Lay two lines of sacks around the perimeter of the roof and along the ridge. Backfill the remainder of the area with loose substrate to the same level as the sacks allowing 10% extra for settlement. Mixed substrate - bagged and loose substrate combination. Use some of the loose substrate to fill in the small spaces between the substrate sacks. 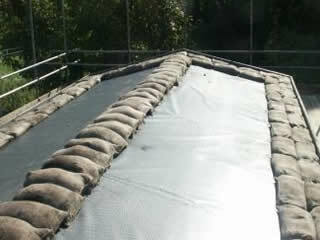 Using our 600x460x100mm woven substrate sacks (allowing 3.8 sacks per m²) cover the whole roof area. Using sacks helps to give permanent structural strength. Using loose substrate, apply a screed layer of substrate over the substrate sacks and brush in to ensure any gaps are properly filled. Lay drip irrigation system, if required (recommended). 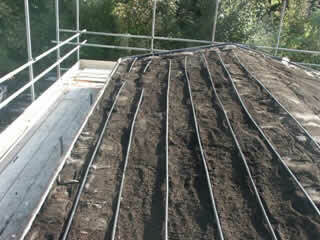 Pipes should be laid across the gradient of the roof slope with T joints to a vertical supply/feeder pipe. Please request information about our irrigation kits. Lay the turf paying attention to abutting turf joints and ensuring turf roots are in contact with the substrate. Any gaps should be filled with loose substrate. Water turf daily (if it does not rain) until the roots have established (allow two weeks minimum). Do not flood the turf when watering but ensure the substrate is damp. Once established revert to occasional watering as per the maintenance sheet. 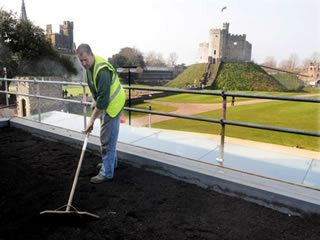 For aftercare after the green roof is established please refer to our maintenance sheet below. Water well while the turf establishes itself. 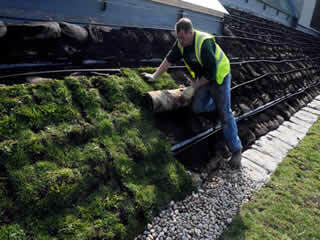 Lift a corner of the turf to check that the growing medium beneath the turf is also damp. Future water requirements will be dependent on substrate type and depth. 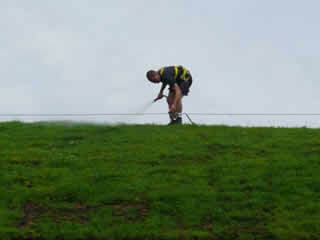 Watering the turf during the summer months and dry spells will prolong the flowering period. A leaky pipe irrigation system installed beneath the turf is the ideal way to cover all eventualities. One cut per year is required in late summer/autumn – strim, mow or cut with shears to a height of 2-3 inches (50-75mm). Rake up and remove cut material and ensure that no decaying material is left on the turf as this will suppress future growth and prevent germination of new seeds. An open sward over the winter ensures healthy, disease free plants which can benefit from what light is available to them during these months. As the spring approaches the wildflowers and grasses are in the perfect position to develop flowers and seed heads quickly to repeat their life cycle. There is minimal requirement for fertiliser. An occasional dressing may be required with certain types of substrate/growing medium. Please contact us for more information and advice. 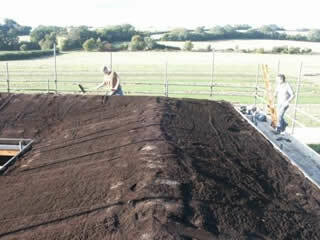 Once the turf has flowered and set seed the roof becomes self sustaining. New seeds will drop after flowering and these will germinate to provide flowers for the following season. Working at height on a roof is hazardous. Extreme care must be taken when carrying out any work and it is essential that it is safe to carry out the work. Do not work alone. Emergency procedures must be put in place prior to carrying out any work whatever and whoever it involves in case there is an accident. Business users and contractors must undertake full risk assessments where appropriate prior to carrying out operations and abide by the relevant Health & Safety regulations relating to the tasks being carried out. Please refer to the Health & Safety Executive website for further information. If in doubt, do not proceed with the work but seek further advice.